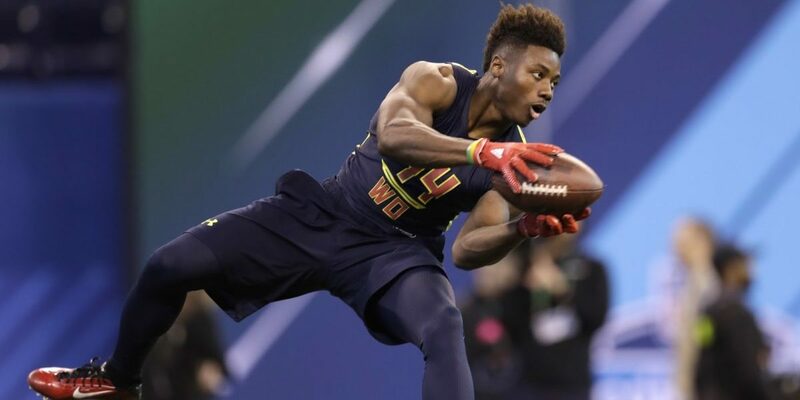 Arguably one of the youngest football players in the National Football League (NFL), Curtis Samuel is a talented and skillful footballer who represents the Carolina Panthers in the NFL as a wide receiver. He dons the No.10 jersey for the Charlotte-based football team and has proven himself to be a stroke of genius and a desirable feature. Being a sensational wide receiver, Samuel has won many hearts with his on-field performances right from his high school days to this point of immense stardom and popularity. In spite of the fact that the footballer is relatively new in the NFL, his personal life and career are already subjects of interest to his fans, colleagues, rivals, as well as the general public. It is for this reason that we bring you lesser-known facts about the fast-rising football player. The Carolina Panthers’ wide receiver was born on the 11th day of August 1996, in Brooklyn, New York, in the United States. He was born to Nicole Samuel (mother) and Curtis Council (father), who are both of Afro-American ethnicity. The football player was single-handedly raised by his mother in Kingsborough Houses, in Brooklyn, along with his sister. It was in the same apartment that his mother and uncles, including Rasheem Samuel, were raised. He has a cousin called Rashuan Samuel who is a footballer. His mom, Nicole, has been together with Curtis’s stepfather, Roy Armstead, for eleven years. The couple got connected at a football match and has been very supportive of their individual careers. Roy runs a youth football program called the Brooklyn Saints and was Curtis’s youth coach. The NFL star owes his high school education to Erasmus Hall High School, Brooklyn, where he ran track and also featured as a running back under the guidance of Danny Landberg. During his junior year, Samuel scored 13 touchdowns, rushed for over 1,000 yards, scored two punt return touchdowns as well as three receiving touchdowns. Samuel would up his impressive record in his senior year by rushing for 1,461 yards with 17 touchdowns and was eventually named a four-star recruit by Rivals.com and the ninth-best wide receiver in his class. The footballer’s next stop in his academic journey was at Ohio State University. He joined the University in August 2013 and fully got enrolled into the institution in January 2014. Curtis was part of the college football team’s 2014–2016 seasons and was coached by Urban Meyer. As detailed in his collegiate statistics, the Brooklyn-born footballer had six rushing touchdowns, 58 carries for 383 rushing yards, and 11 receptions for 95 receiving yards in the 2014 season. Curtis also had a productive 2015 at Ohio State as he recorded one rushing touchdown to move along with twenty-two receptions for 289 receiving yards, 17 carries for 132 rushing yards as well as two receiving touchdowns. He ended the 2016 season with eight rushing touchdowns to move along with 74 receptions for 865 receiving yards, 97 carries for 771 rushing yards and seven receiving touchdowns. Curtis stormed the football league in 2017 after he was selected as the 40th overall in the second round of the 2017 NFL Draft by the Carolina Panthers. The team signed a four-year deal with the footballer worth $6.45 million on May 5, 2017. The contract came with $4.05 million guaranteed as well as a signing bonus worth $2.83 million. Samuel recorded his first two career receptions in a victory game against Buffalo Bills on September 17, 2017. He also recorded a 31-yard rush on an end-around in a game against the New Orleans Saints. The NFL player sustained a left ankle injury on November 14, 2017, in a game against Miami Dolphins, which abruptly ended his rookie season. Following a successful surgery, he was placed on injured reserve by his team on November 24, 2017. Generally, Curtis Samuel wrapped up his rookie season with four carries for 64 rushing yards in nine games and 15 receptions for 115 receiving yards. As of 2017, his career statistics is detailed as follows: Receptions – 15, Total return yards – 221, Rushing attempts – 4, Total touchdowns – 0, Receiving yards – 115, and Rushing yards – 64. His career highlights and awards include – First Team All-American (Sporting News)(2016), 2× Varsity O Recipient, Sugar Bowl Champion (2015), First Team All-Big Ten (Coaches/Media/AP -2016), CFP National Champion (2015), Co-Big Ten Offensive Player of the Week (11/7/16), Fiesta Bowl Champion (2016), and Big Ten Champion (2014). Curtis Samuel is 5 feet 11 inches tall, which is equivalent to 1.80 in the metric unit while his weight is measured at 200 lb or 91 kilograms.